Sumptuous fur and ravishing color, like that on a dress created for Denise Poiret to wear to the wedding of Germaine Boivin in 1921, offer embellishment on minimal shapes. Oscar de la Renta fuchsia brocade and wolverine-hem dress and shoes. VBH earrings. Chanel gloves. Wolford tights. Languid lines, such as those of Poiret’s robes sacs, allowed ladies to leave behind the binds of corset dressing and overwrought opulence. Vera Wang jeweled-and-sequined silver chemise. Fred Leighton earrings. Hari Gems necklace and rings. Poiret created whimsical designs for his children, as well, such as a chain-mail-topped dress for daughter Perrine in 1922. Alexander McQueen metal-ring tank and black ostrich-feather skirt. Fred Leighton earrings and bag. Hari Gems and VBH rings. Wolford tights. Russes, Persian dancers, and Arabian Nights all populated Poiret’s fantasy landscape. Balenciaga by Nicolas Ghesquière silk muslin, wool felt, and badger-fur-trim dress, rabbit-and-badger chapka, tights, and badger boots. Fred Leighton ring and bag. 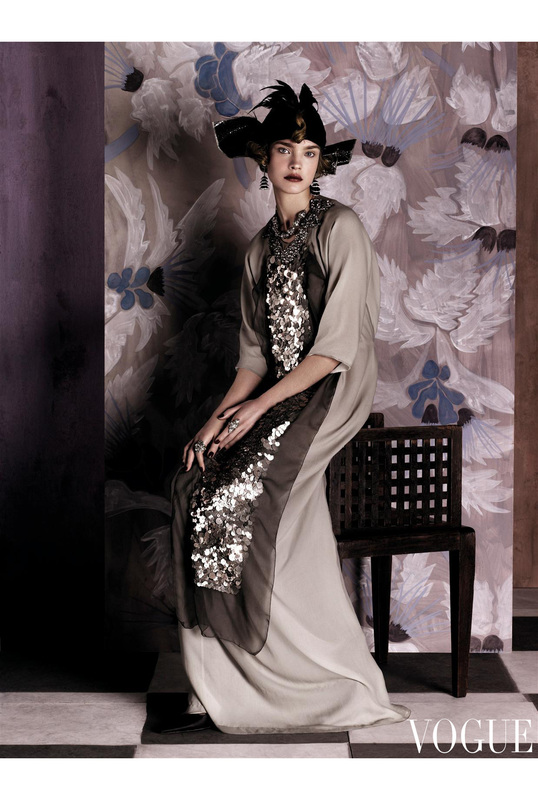 For her husband’s famed Thousand and Second Night ball, in 1911, Denise Poiret, channeled here by Natalia Vodianova, wore a gold lamé turban with turquoise and aigrette embellishment. Dior Haute Couture slate silk-gazar cocktail dress and gloves. Fred Leighton earrings. Evocative of a kimono, Poiret’s early Confucius coat was startlingly forward-thinking. 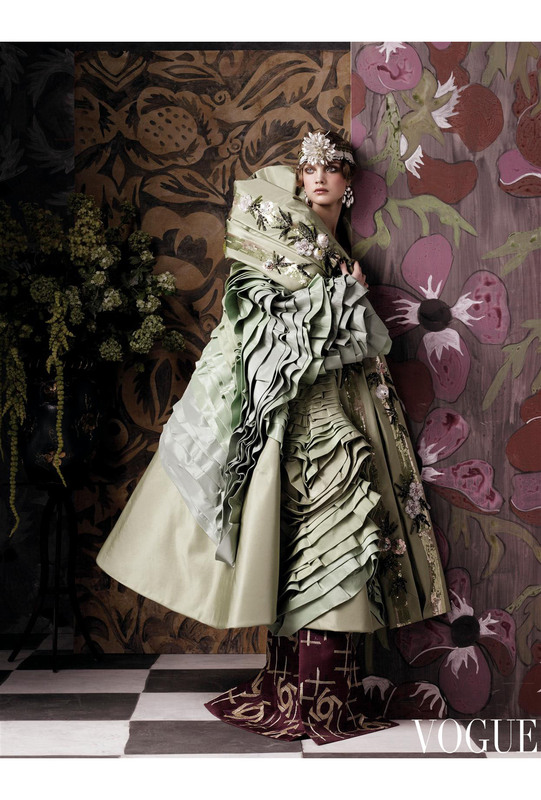 Dior Haute Couture embroidered mint silk evening coat, embroidered violet silk dress, and floral headpiece. Fred Leighton earrings. The hourglass reigned supreme—until Poiret ushered in unexpected volumes and fluidity. Rodarte moss organza dress with feather flowers and gloves. Captivated by the Austrian design workshop Wiener Werkstätte, Poiret employed graphic motifs and simple shapes. Proenza Schouler black-and-white jacquard coat with fur trim, wool pencil skirt with fur hem, fur hat, gloves, and patent python boots. VBH earrings. Another storied client, the Marchesa Casati, might have worn this dress—in Poiret’s Directoire silhouette—to walk her pet cheetah through the streets of Venice. Chanel Haute Couture chiffon panther-print dress, gold turban, and shoes. Fred Leighton earrings. Hari Gems ring. 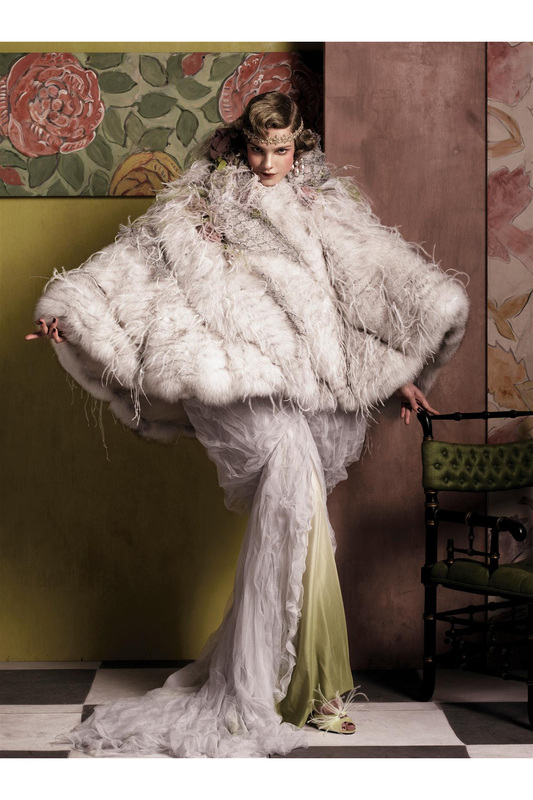 Feathers, such as the white grebe used on a manteau du soir in 1911, accented Poiret’s signature styles. Chanel Haute Couture black chiffon dress embroidered with white and black sequins and strass, chiffon embellished headband, and rose and white swan-feather gloves. Fred Leighton earrings and bag. Hari Gems ring. In another homage to Oriental dress, Poiret translated the lampshade skirt as a wired tunic over a skirt or harem pants. Thakoon dove-gray pin-tuck dress and tulle T-shirt. Lorraine Schwartz belt. Fred Leighton earrings and rings. Nineteen-twenties society free spirit Nancy Cunard was one of the flamboyant women who adored Poiret’s designs. Armani Privé spaghetti strap flapper dress with crystal embroidery, and necklace. Hari Gems ring. Stephen Russell snake bracelet.